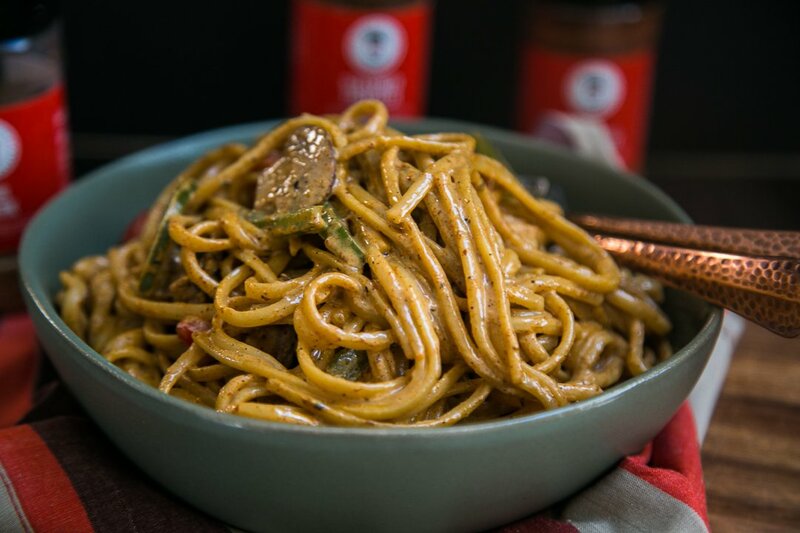 I am so excited to finally share this recipe with you all- and most importantly talk about these Uncle T spices!! When Tarun, aka “Uncle T” reached out to me, I told him what I tell most brands- send me some product to try- and if I’m a fan I’ll get back to you- and I’ll gladly share with my followers. Well as you can guess, he sent me ALL of his spices, I tried them out and of course I was a FAN. I spoke to him on the phone after and was blown away about his knowledge of spices, and just the overall approach he is taking to providing a quality product to consumers. 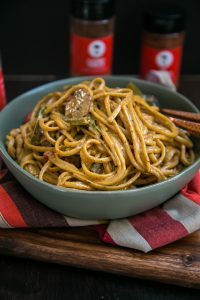 Many of you have already asked me to include substitutes for the Uncle T spices in this recipe- but I used three of his blends- and each of the blends is over 5 ingredients- so you can see why that would be difficult for me. Instead, I urge you to support this brand who is doing A LOT of things right- the spices are free of preservatives and dyes, no/low sodium, and made small batch to ensure the highest quality and consistency. I also promise you will find MULTIPLE uses for these spices!! Click HERE to purchase these spices and Use code “Chutney” for 10% off your entire order!! 1- Who is Uncle T?- Being the son of immigrant parents is what started my culinary journey. My parents worked two jobs and had their own perfume business when I was a young kid, so being able to spend time in the kitchen with my mom was one of the few times we got to be together. Grocery shopping with my father after he would come home from work was how we bonded. He would teach me how to buy produce and fruits, he showed me how to shop on a budget, he showed me all the things needed to run your own kitchen. Cooking is one of the great joys in my life because of all the fond memories I have in the kitchen with my parents. The older I got, the more my taste buds and palate expanded, and as I traveled the world, I became familiar with flavors from different regions. I knew I would one day need an outlet to merge these things together. As a proud family-owned business, we often consult our family on important decisions and when I finally decided to pursue my passion and start this company, we needed a name. Since my name is Tarun and my nieces call me Uncle T, it seemed like a perfect way to keep the family at the forefront of our business…but now I owe my nieces parents. I told them I would pay her college tuition, that’s a fair trade, no? 2- How did you get started in the industry and why did you create your own spice blends?- I am a self-taught chef who specializes in BBQ, Asian and Italian. I have traveled and learned from some of the best chefs in the world. We decided to create our own spice blends to offer three things to the world, 1. We wanted to bring an all-natural blends free from artificial colors, dyes, and preservatives. 2. 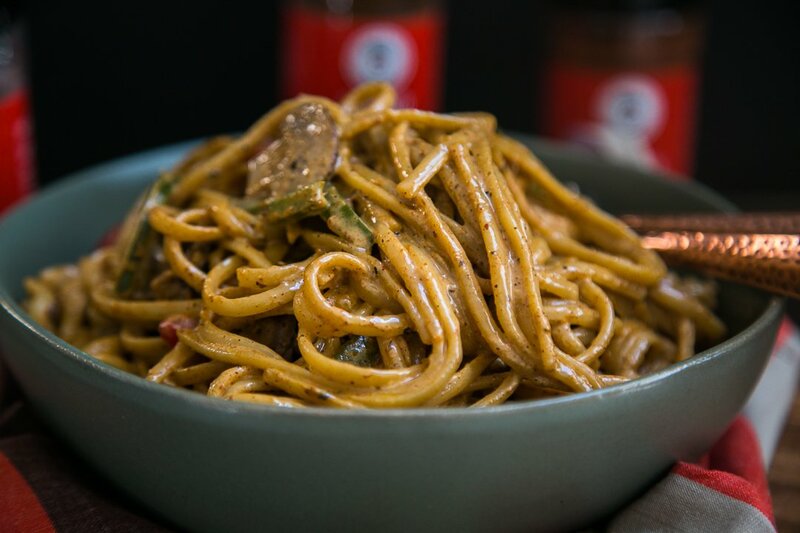 We wanted to make it easy for our customers (who we call Uncle T Family) to try authentic flavors from all over the world without leaving the comfort of their home and last but not least 3. We wanted to do all the hard for you so you can enjoy the cooking experience with your family, no need to travel all over the place from store to store looking for hard to find Exotic ingredients. Simply open a bottle and cook. 3- The name are so catchy how do you come up with them and where are they sourced? – Each one of the names has a back story. We are a family owned business and I have my best friend and his wife as partners, we all use things from our lives to come with the names, for example, “Such a Jerk” , when my wife was pregnant she would have cravings for jerk chicken all the time…there was a small little “hole in the wall” restaurant named “Flavors Paradise” in Brooklyn N.Y. and we would go there all the time and at very odd hours. The owner and I became friends and I found myself calling him personally to get some jerk chicken. He would even let me sometimes cook in his kitchen and the friendship blossomed from there. He unfortunately had to close his restaurant and move to Philadelphia so now anytime we want some amazing jerk chicken we have to travel to Philadelphia. He gave me his jerk recipe and we used that to develop our ingredients and ensure we had an authentic taste. 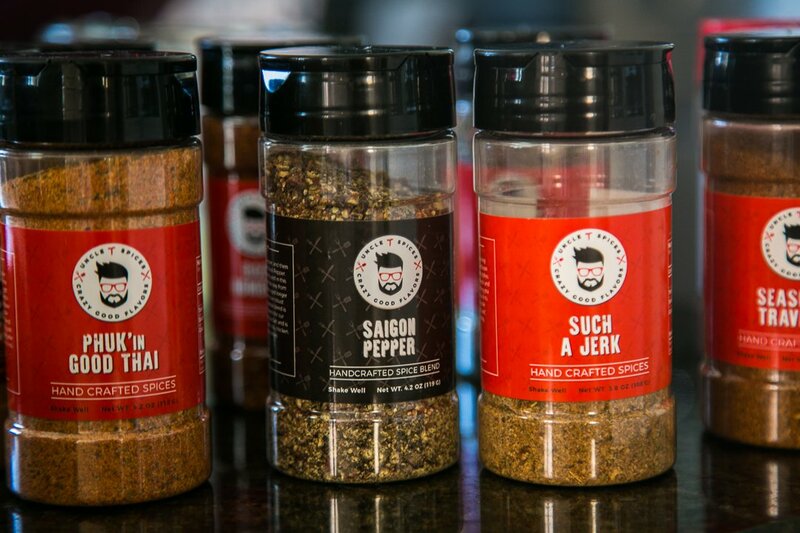 When we were looking for a name for the jerk spice blend I called my friend and told him we were doing a jerk spice and we were going to name it after him…he was a jerk for closing his restaurant so we called it “Such a Jerk” . Our ingredients come from all over the world for that authentic taste and flavors, “Such a Jerk has scotch bonnet peppers from Kingston Jamaica, “PHUK’in Good Thai” has lemon grass from Phuket, our “Saigon Pepper” has Peppercorn from Vietnam. We use authentic ingredients so you get an authentic flavor. 4- What do you mean when you say made in Small batches and what’s the benefit?– We always make our spice blends in small batches because of the quality. The flavor and taste have to be perfect. We use all natural ingredients and it’s hard to find natural ingredients on a large scale, if you are importing 500 lbs. of pepper you will need a way to keep it shelf stable for a longer time, so you will have to add in preservatives and chemicals to ensure the pepper doesn’t go bad… This is the main reason why other spice companies have such a high sugar or sodium content. We always blend in 40 – 50 lbs. batches, so it creates a more consistent spice blend and allows us to buy fresh and natural ingredients and get them over to our Family at its peak freshness. If we get it fresh, package it fresh…you get FRESH! 5-Why is Low or no Sodium important?– Research shows that people consume about 50 percent more sodium every day, on average than the maximum amount they should (2,300 mg). That’s cause for concern because high sodium in your diet can contribute to high blood pressure and potentially harm your heart. A majority of sodium in our diets comes from packaged foods and restaurant dishes. But changing your seasoning habits while cooking or at the table can make a difference. So enjoy our spice blends with all the Flavor and none/less of the Sodium. 6- How to use our spice blends?– Our blends can be enjoyed in many ways. They can be used as marinades when added to oils or juices, as a dry rub while food is raw, or as a flavor enhancer once the food is cooked. They can be added to beverages- our Bad Hombre makes a wicked Bloody Mary or Michelada and our Red Sea Salt is the perfect colorful rim for Margaritas. They can be used to bake fresh bread and appetizers, or pair with a charcuterie board. Once you try them, you’ll pretty much use them on everything. Heat a large skillet over medium high heat and add butter and oil. Add the bell peppers to the skillet and let cook for 2-3 minutes. Add mushrooms and cook an additional 2-3 minutes. Add the Uncle T's Good Stuff seasoning & Uncle T's Jerk Seasoning, salt, and continue to stir and cook the peppers and mushrooms over medium high/ low heat- stirring constantly and making sure not to burn the spices. 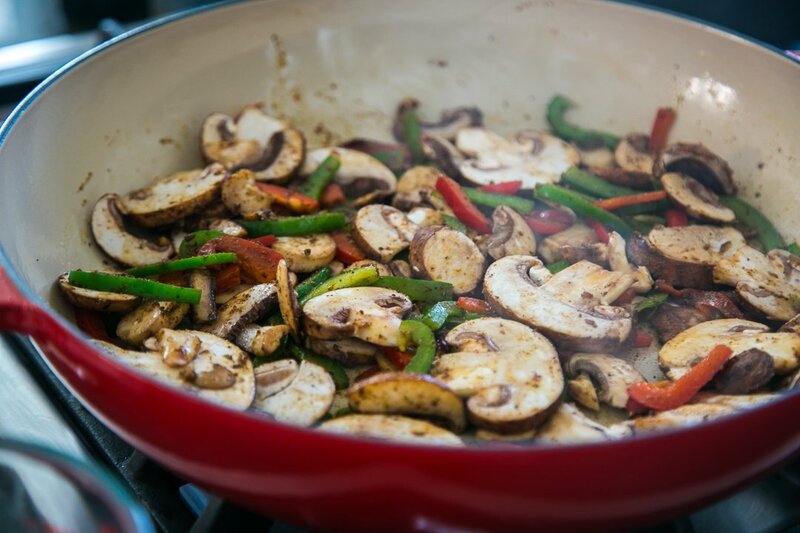 When the peppers and mushrooms are slightly browned add the garlic and continue to stir until the garlic is fragrant. Add in splashes of the vegetable broth in small amounts- scraping up any browned bits on the pan with every addition until you've added all of it. Turn off heat, squeeze fresh lemon over the pasta- and garnish with chopped fresh parsley (optional). The amount of vegetable broth or half & half you may need could vary in this recipe based on how "al dente" your linguini is or is not. If it is more on the "al dente" side- your pasta will soak up more of the liquid and you may need more broth/half and half to achieve the creamy consistency. Adjust additional seasonings based on this as well.